Welding Technology — CTE: It's Working! Time will be spent in the Welding Lab at MMCC. Students should have good oral and written communication skills, as well as the ability to work well with others. Students will spend their first semester focused on welding safety and an introduction to the welding field. Students will use Moodle as a learning management tool to access lecture materials while working hands-on in a laboratory setting. When it comes to job prospects for the near future, it’s simple: America needs welders. Employers in manufacturing and fabrication of many different varieties are looking for ambitious, knowledgeable welders, so if you enjoy making things, working with your hands, working with machines and taking pride in your work, consider this high-demand class the first spark of a bright future career. Students will learn the art and technology of joining metals together with heat, using special equipment to perform different welding processes such as oxy-fuel cutting and brazing, gas metal arc and shielded metal arc welding. They will also learn to accurately fabricate a project, work from blueprints, repair broken parts, problem-solve a welding dilemma and use math and measurement skills to set up and lay out the parts used for the welding project. This is a welding course that applies many of the major processes used in major industries. From Day One, you’ll be learning about safety. You’ll be getting dirty. You’ll be making sparks. Because this is a dual enrollment class with MMCC, it’s a great opportunity to take advantage of the whole CTE experience. There are a ton of job opportunities in all 50 states for welding, meaning this is a career that has boundless opportunities in the job market, locally and nationally. Students who successfully complete the coursework for the welding program are earning college credit toward a credential, certificate or degree from Mid Michigan Community College. 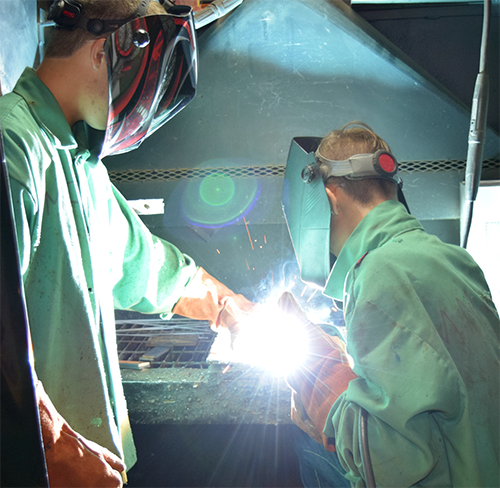 The welding program pathway is designed so that students can ladder their education and begin earning credit toward a welding certification while a junior in high school. Students may earn the state-required fourth-year math-related course credit through this program. Local high schools will award credit upon successful completion of this program. The CTE Certificate of Completion will be awarded to students who successfully complete their programs. In addition, students can earn college credits upon successful completion of their courses, ultimately leading toward a credential, certificate or degree.